Sleep and Eat 2018 delivered yet another spectacular variety of products, concepts and design inspiration for the Hotel, Restaurant and Bar industry. 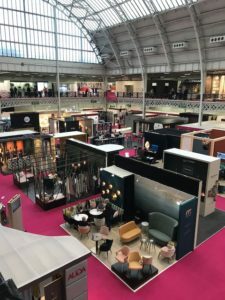 Hundreds of Hospitality Experts showcased their range of products and design inspiration to the thousands of Hoteliers, Restauranters and Designers through its doors at London’s Olympia. The Event also offered a plethora of opportunity to Network amongst likeminded industry professionals and attend the various Conferences, Sleep and Eat really does live up to its reputatation as being one of Europes most exciting and informative design and architecture shows. Gainsborough Events Management delivered an experienced service, with staff controlling access, carrying out patrols and operating an organised control facility. The Gainsborough Team enjoy a successful relationship with our Client and worked alongside the onsite Health and Safety Team to ensure a safe and enjoyable Visitor experience.